This bike was purchased new in either 1973 or '74. It is a one-owner bike that has not been riden for quite a few years. I am acting as agent for the original owner to handle the sale. It has a 59 cm top tube, 43 cm chainstays. Cinelli 13 cm handlebar stem. Complete Campagnolo Nuovo Record group. 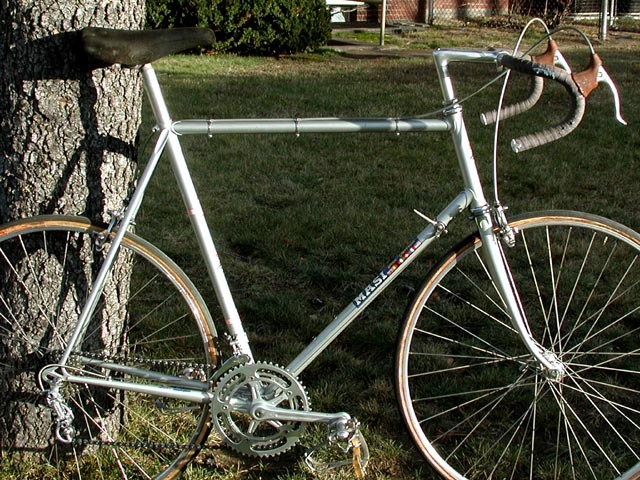 The owner originally contacted Masi in Italy about buying a bike, and they wrote back that they had just started an operation in Carlsbad California, and that he could get a U.S. made one, rather than needing to import from Italy. He contacted Masi USA, they told him they had just started up, weren't fully up and running, but could provide the bike he desired. This is it, serial #1000. The bike has been hanging for quite a while. I did some light cleaning and replaced the broken rear derailer. I also straightened the frame derailer hanger, which was slightly bent, and did a bit of truing to the rear wheel. This bike is all original, except for the tires. The paint and decals are in very nice condition, this bike is a prime candidate for restoration with minimal effort. This bike still has the original Martano rims, which appear to be in good shape, as far as I can tell without removing the tires. The original owner didn't like the original Unicanitor suede saddle, so he installed an Avocet...but he saved the Unicanitor, which I have put back on the bike. It shows some use, but is basically in quite nice condition for its age. The bike came with an Everest 14-22 freewheel, which the owner found rather stiff. He replaced it with an Everest 14-26, which is currently on the bike. He saved the 14-22, and it will be included with the bike. It is virtually unused. The bike has a Sedisport chain. I don't know if this is original or not...I suspect that the chain was replaced when the larger freewheel was installed, because the original chain probably would not have been long enough. The bike suffered a fall on its right side. You can see the damage to the handlebar tape. The Cinelli Giro handlebar is slightly bent inward on the right side. The rear derailer had gone into the spokes, and been broken in two. I have replced the damaged derailer with a contemporary Nuovo Record unit. The rear wheel spokes were very loose, and some were bent from the derailer incident. I did some minor truing, but would not recommend actually riding on the rear wheel in its present state. At a minimum, the tire should be removed to facilitate a proper truing and tensioning of the wheel. The rubber hood covers on the brake levers are deteriorated. The tires are old, but not original. The rear holds air, but ride it at your own risk. The front holds air long enough to take photos, but I wouldn't trust it. The 14-26 freewheel currently installed has one of its removal notches damaged, and it may not be possible to remove this freewheel without destroying it.